My stint as a Cybils panelist turned me on to novels in verse. So I was thrilled to read Caroline Starr Rose's May B. Caroline is a fellow member of the team at Project Mayhem, and she has created a very special novel. Opening Lines: I won't go. Why I liked it: Mavis Elizabeth Betterly, a.k.a. May B. is a spunky heroine. Her struggles with reading, and the treatment she receives from Teacher, are heartrending. In crystalline verse, Caroline Rose paints a vivid picture of life on the frontier and its struggles. I was with May all the way as she tried to survive the elements in a sod house with only limited provisions. This novel is a testament to the human spirit.
!) 1) I read in your bio that you spent part of your childhood in Saudi Arabia. How did you end up there? What life experience there did you find interesting or challenging? My dad was with the Corps of Engineers and did construction work in Saudi. As we moved there when I was three and left when I was six, the real challenges came when I returned to the US. There was so much I didn’t know: American slang, playground games, TV shows, and the like. The first time I saw a deer-crossing sign, I asked my mom why there was a picture of a goat on the side of the road. Culturally, I was an outsider in my own country. This is an idea I’m playing with in my next verse novel. 2) Your writing journey has had its share of exciting events. Your first publisher, Tricycle Press, was shut down by parent company Random House just before you were to receive ARCs. Can you tell us a little about that situation, and how it resolved? May B. sold in the spring of 2010 with an initial publication date of September 2011. Weeks before my ARCs were to run, Tricycle folded as a result of the economic down turn. It was heartbreaking to lose my editor as well as a publishing house I had followed for years (Tricycle mainly published picture books, and many made their way into our home while my boys were young). When Tricycle closed, the books that were slated for summer and fall 2011 were left in limbo: Random House imprints had the option of picking up titles (there were roughly two dozen, I believe). For books that weren’t kept on, contracts were honored (meaning authors got paid what they had been promised), but those books had to be shopped elsewhere. Random House kept five Tricycle titles, and fortunately, May B. was one of them (now as a part of imprint Schwartz and Wade). I went through three more rounds of edits with my new editor, and my publication date was pushed forward to January 2012. As hard as it all was (especially the month and a half I didn’t know my book’s fate), this all benefited my book: both of my editors brought their unique insight to May B. and made her better for it. 3) May B. (a.k.a. Mavis Elizabeth Betterly) goes through a lot and shows remarkable resilience. She has dyslexia and struggles to read. Have you yourself had experience with dyslexic students? I have, though I am no expert. I’ve taught all over the country, and several of my classrooms were inclusion based, meaning a special education teacher worked alongside me, in my room, with our learning disabled kids, pulling them from this setting only minimally for things such as testing. Though May isn’t based on any one person, I will confess to a handful of kids I wish I’d done more for. It is a huge responsibility to be in charge of a child’s education, and I wasn’t always qualified, aware of, or -- honestly -- sensitive enough to uncover specific needs. That’s not the most flattering thing to admit about myself, but in creating this character and especially her teachers, it was something I was forced to examine in my own life. 4) The language in May B. is often exquisite. Did you always conceive the novel as a novel-in-verse? What particular challenges did you face writing in this style? That’s so kind of you to say! May didn’t start as verse. The first few scenes I poked at really frustrated me: what I wanted to express and what ended up on the page were very different. I went back to my research, and in studying the first-hand accounts of frontier women, I noticed there were patterns in the ways they expressed themselves. Much of their writing was matter-of-fact and spare. I tried to mirror their voices in May’s story. What I wrote this way felt as close to the bone and as honest as I could get. Really, I stumbled into verse and am so glad I did! As far as challenges go, writing a verse novel is not a speedy endeavor. May B. has simultaneously been the most and least difficult book I’ve ever written: once I found May’s voice, the writing was alive and real. Getting the words out, however, took hard work. 5) You are a member of the group blog, Project Mayhem. Have you found blogging to be a help in your writing career, and if so, in what ways? I’m not sure if blogging is a help I can measure quantitatively, though it certainly has been a great boon to my writerly life. After all those years of rejection and solitude, starting my own blog and getting instant feedback was huge. As a part of Project Mayhem, I’m able to work with others who share my same passion, cheer on their successes, and learn from their experiences. 6) We're celebrating your recent news--the sale of a picture book called OVER IN THE WETLANDS to Schwartz and Wade. What is it about, and how did the writing of it unfold? Thank you! I’m excited to learn how picture books work and am thrilled to be with Schwartz and Wade again. My family moved to Louisiana a year and a half after Hurricane Katrina. All the local talk was about wetland erosion and attempts at preservation. I’d never heard of this pressing ecological problem discussed nationally, and after falling in love with the culture, the community, and the gorgeous surroundings, I decided to write about this amazing slice of our country. Wetlands serve as speed bumps during storms, are homes to a variety of unique flora and fauna, and are natural filtration systems. Due to many factors, including levees along the northern portion of the Mississippi and the building of canals, much of the Mississippi River’s rich silt is no longer deposited at the Delta and nearby barrier islands. Instead, it is washed out to sea. Just months after writing my first draft, we endured both Hurricanes Gustav and Ike, the second of which flooded thousands of homes in the southernmost part of our region, Terrebonne Parish. And then came the oil spill. Louisiana’s wetlands were suddenly known at the national level. The story felt more timely than ever. I hope you've enjoyed getting to know Caroline and her creation, May B. Leave a comment and you'll be entered to win my copy of May B. "Good Books for Bad Children"
In honor of President's Day (and to deal with the fact that I don't have an MMGM for you,) I'm sharing an article I read in my beloved Shelf Awareness. [If you don't subscribe to S.A., you really must.] Ursula Nordstrom sounds like my kind of woman! As an added benefit, I've also discovered a new blog: Brain Pickings (see the link at the end of the article). This looks right up my alley as well!! "I was taken out to luncheon and offered, with great ceremony, the opportunity to be an editor in the adult department. The implication, of course, was that since I had learned to publish books for children with considerable success perhaps I was now ready to move along (or up) to the adult field. I almost pushed the luncheon table into the lap of the pompous gentleman opposite me and then explained kindly that publishing children's books was what I did, that I couldn't possibly be interested in books for dead dull finished adults, and thank you very much but I had to get back to my desk to publish some more good books for bad children." --Ursula Nordstrom, who was head of Harper's department of books for boys and girls from 1940 to 1973 (from the book Dear Genius: The Letters of Ursula Nordstrom, which was showcased by the Brain Pickings blog). 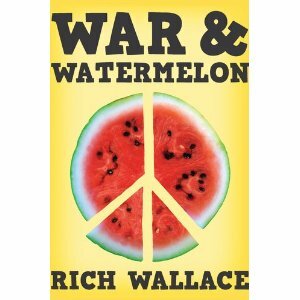 War and Watermelon by Rich Wallace (Viking, 2011) is another Cybils nominee that I found compelling -- despite having a lot of football stuff. (The mafioso didn't grow up playing football, and still finds it mystifying. His misspent youth was on the bocce court.) If a writer can make sports interesting--which Rich Wallace can--it speaks volumes for that writer's skill. Opening Lines: I look across the pool and see Patty Moriarty and Janet DeMaria hanging out by the refreshment stand. They're in two piece bathing suits, but not bikinis. They're the type of girls that are over our heads. Not at the top of the list of coolest girls, but close to it. We're pretty much near the bottom of the guys; low-middle at best. The story: (from Goodreads) It's the summer of 1969. We've just landed on the moon, the Vietnam War is heating up, the Mets are beginning their famous World Series run, and Woodstock is rocking upstate New York. Down in New Jersey, twelve-year-old Brody is mostly concerned with the top ten hits on the radio and how much playing time he'll get on the football team. But when he goes along for the ride to Woodstock with his older brother and sees the mass of humanity there, he starts to wake up to the world around him-a world that could take away the brother he loves. Why I liked it: Wallace does a great job capturing the voice of twelve-year old Brodie, and gives him a believable inner life, with all the changes that are going on at that age. What looms over everything, however, is the Vietnam war, and the fact that Brodie's older brother, Ryan, will be eligible for the draft. Ryan and their father have supreme moments of tension, but there is redemption at the end. A satisfying story in every way. About the Author: Rich Wallace is the author of novels such as Wrestling Starbridge and the Winning Season series. He lives in New Hampshire. You can learn more about him in this bio from his website. Akoss, one of our regular Marvelous Middle Grade Monday peeps. Akoss blogs at Nye Louwon -- My Spirit. You can also follow her on Twitter @akossket. 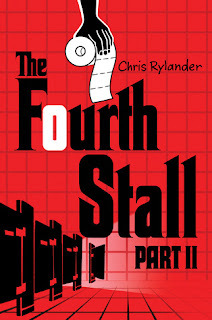 The Fourth Stall, part II by Chris Rylander (Walden Pond Press, release date February 7, 2012) Wowzers, Yowzers, rottweilers, and schnauzers: we're a mere day away from the release date of Chris Rylander's sequel to The Fourth Stall, the book that started it all off here at Middle Grade Mafioso. The Don has even constructed me my own fourth stall, so I can type away in peace, and without the dastardly Luca Brasi, Jr. trying to undermine my efforts. (For more of the history between Luca and yours truly, look HERE.) The clacking of my typewriter keys is, needless to say, very peaceful--and I can totally empathize with Mac, the hero of the Fourth Stall. This is prime real estate. The Fourth Stall part II carries on where #1 left off. Having one-upped Staples, Mac and his cohorts are back doing business. But strange things are happening at the school. An attractive, but slightly dangerous-seeming 8th-grade girl, going by the name of Trixie Von Parkway, wants Mac to get the new science teacher, Mr. Kjelson, off her back. In fact, ever since Mr. Kjelson arrived, things have been going downhill at the school. The new cafeteria menu seems designed to give coronaries, rodent poop has been found in the lockers, the staff are desperately trying to get the students to pass the new SMARTS test, and the new vice principal seems hell-bent on putting Mac out of business. And yes, I sort of let the schnauzer out of the bag: the way this book ends has Part Three written all over it, with the surprise appearance of a character asking Mac for help. So stay tuned!! All in all, fans of The Fourth Stall will be in for a treat with The Fourth Stall, part II. Hey: I've got even more good news. 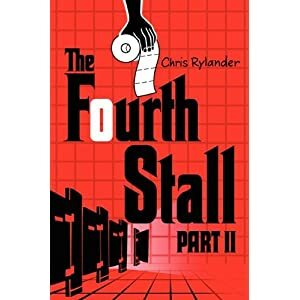 I have an ARC of The Fourth Stall, part II, which was generously given me by the publisher, to give away to one lucky commenter. All I ask is that you follow the blog. Any mentions on Twitter will also earn you some Brownie points. 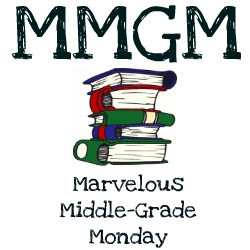 Now, go and read all the other amazing Marvelous Middle Grade Monday folks over on my blog sidebar. HAPPY READING! !